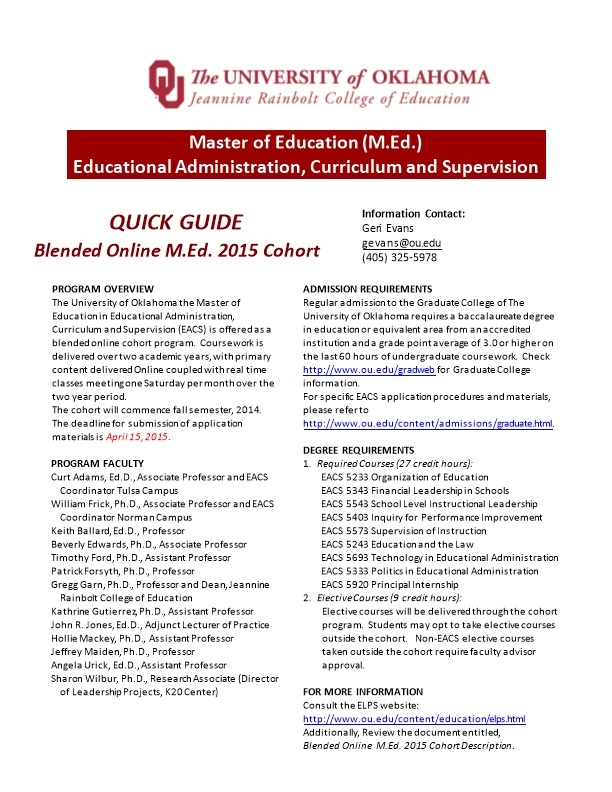 The University of Oklahoma the Master of Education in Educational Administration, Curriculum and Supervision (EACS) is offered as a blended online cohort program. Coursework is delivered over two academic years, with primary content delivered Online coupled with real time classes meeting one Saturday per month over the two year period. The cohort will commence fall semester, 2014. The deadline for submission of application materials is April 15, 2015. Regular admission to the Graduate College of The University of Oklahoma requires a baccalaureate degree in education or equivalent area from an accredited institution and a grade point average of 3.0 or higher on the last 60 hours of undergraduate coursework. Check Graduate College information. Elective courses will be delivered through the cohort program. Students may opt to take elective courses outside the cohort. Non-EACS elective courses taken outside the cohort require faculty advisor approval. Blended Online M.Ed. 2015 Cohort Description. The Educational Administration Curriculum and Supervision Admissions information is available at This link provides the admission criteria information that you will need to complete and submit as an applicant whereas you will upload the material when you are completing the online application.